Just barely a week after Microsoft officially made available Windows 7 RC download with the build version of 7100 publicly, a newer build of Windows 7 has been compiled by Microsoft and released to internal testers. And of course, the Windows 7 build 7127, which is post-Release Candidate build on the RTM-branch of Windows 7 operating system development tree has also been leaked to BitTorrent (BT) network, in the form of complete ISO files. Microsoft has specified that there will only one and final release candidate available officially before the final RTM general availability release of Windows 7. Thus, unofficial leaked post-RC builds are the best shots Windows 7 enthusiasts can get a hand on the newer interim build of Windows 7. However, Windows 7 Build 7127 appears to not much different from Windows 7 RC build 7100 in term of user interface. However, there will be bug fixes and under the hood changes. 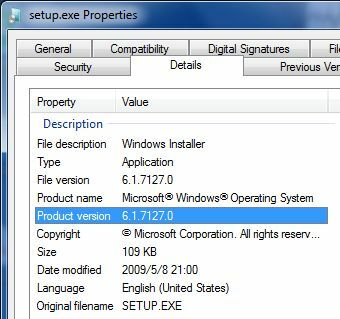 Windows 7 Build 7127 has full build version number of 7127.0.090507.1820, appears to be finalized on May 7, 2009. Windows 7 Build 7127 is the first post-RC build that leaks to date. Windows 7 Build 7106, which only has Chinese version leaked, are likely to be a pre-RC release. Update: Windows 7 Ultimate Build 7137 is leaked. The ISO images of Windows 7 Build 7127 x86 appears to be genuine, judging from the ISO size, and properties of setup.exe. Windows 7 Build 7127 can be activated with the free Windows 7 RC product keys. Besides, it’s now possible to download Windows 7 Build 7127 Language Packs (MUI LIP).